Foster + Partners have completed a new shopping centre that combines high-end boutiques with independent local food and craft markets on the site of a historic city marketplace in Abu Dhabi. 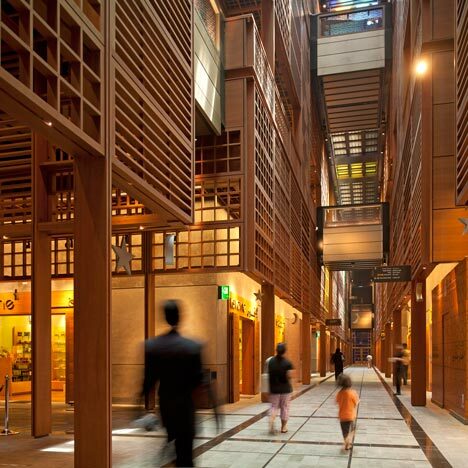 The new Souk Market has been designed as a sequence of courtyards and alleys, integrating balconies and colonnades. Sliding roofs and walls enable controlled ventilation of the market and patterned stained glass windows mark the entrances. Photography is by Nigel Young, Foster + Partners, apart from where stated. Abu Dhabi’s historic Central Market is to be transformed into a dynamic new quarter with markets, shops, offices, apartments and hotels. One of the oldest sites in the city, Central Market will be a reinterpretation of the traditional market place and a new civic heart for Abu Dhabi. The project comprises a combination of lower-rise, ecologically sensitive levels of retail, roof gardens - forming a new public park - and three towers, with generous underground parking. Pushed to the corners of the site to maximise the ground plane, the cluster of towers creates a striking new urban landmark. Like a modern version of the souk, the new Central Market will be a city in microcosm. It will unite high end retail and luxury goods shops with individual courtyards and alleys, together with food markets and craft-based trades specific to the region. Avoiding the generic feel of the universal shopping mall, the scheme will fuse the local vernacular with global aspirations.